Are Discrete Wires Too Outdated For Handheld Devices? Inside a tightly-packaged modern smartphone, flexible circuitry dominates the space, connecting various modules to the main logic board using microminiature board-to-board and FPC connectors. 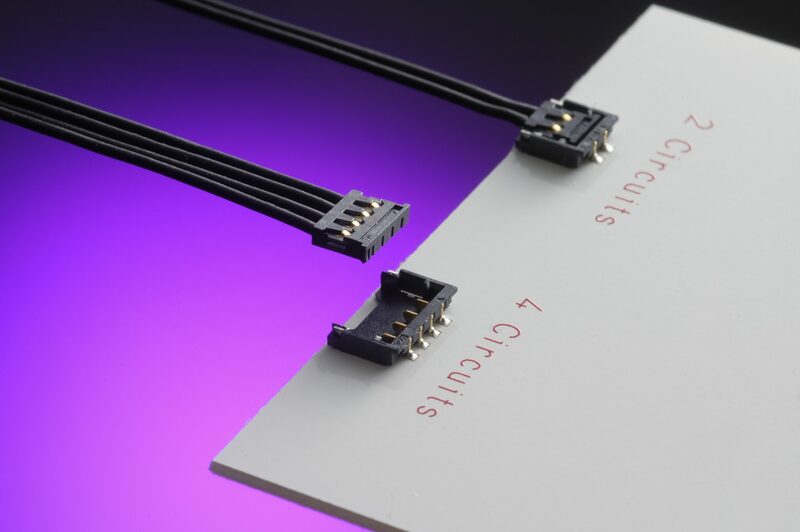 The space-saving and lightweight nature of these components for relatively high circuit size interconnects has certainly contributed toward the never-ending drive for miniaturization. Yet you still occasionally see some conventional discrete wires. Modules such as batteries, speakers and vibra motors are still sometimes connected to the main logic board by discrete wires. These modules may be attached to the chassis of the device, and the flexibility and cost-effective nature of discrete wires provides phone designers the freedom to position such modules almost anywhere. Designers may want to distance certain components from RF modules, which could otherwise negatively impact the performance of their device. Thus, there is still a need for small, low profile wire-to-board interconnect solutions. One of the latest products from Molex, called Pico-EZmate™, is an ultra-low profile, right angle wire-to-board connector in 1.20mm pitch, but with a vertical mating direction. It has a mated height of 1.55mm, and is available in 2 through 5 circuit versions (a 6-circuit version is also available with a mated height of 1.65mm). It is halogen-free and glow-wire compliant. The vertical mating direction is design-friendly because it provides freedom to position other components around the connector on the printed circuit board, whereas conventional right angle wire-to-board connectors with a horizontal mating action typically have to be placed around the edge of the printed circuit board. Needless to say, the vertical mating direction is also operator-friendly for the final assembly operation. Molex’s existing Pico-EZmate connector is being used in applications as diverse as smartphones, notebook PCs, tablet PCs, e-book readers, medical devices, gaming machines, barcode readers, digital cameras, navigation devices, lighting, wireless modems and many, many more. For these applications, the existing connector proved to be quite small enough. But the question now is whether customers in the future will require an even smaller version of this already small, yet manageable product. Smartphone designers are interested in further component miniaturization. But will further miniaturization be practical for their manufacturing partners, from a final assembly point of view? What is your opinion? Pico-EZmate will be showcased at the upcoming Electronica tradeshow in Munich, Germany from November 9th-12th. If you will be attending this show, ask a Molex representative at our booth about Pico-EZmate and our other innovative new miniature wire-to-board connectors.